Win a Tuckerton Seaport Museum Family Membership! Posted on: December 14th, 2017	by Jennifer A. 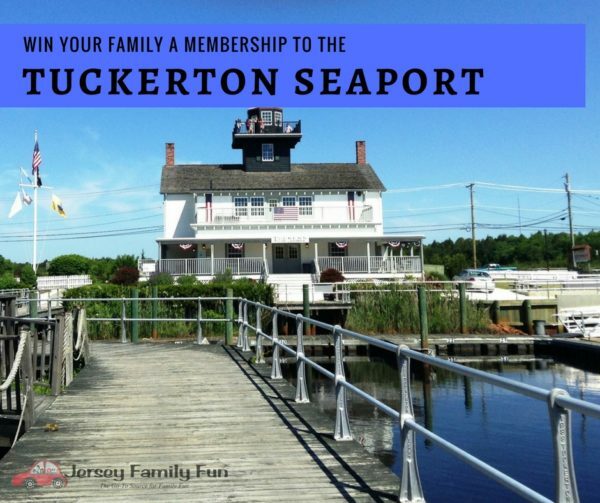 This post about a Tuckerton Seaport Museum Family Membership was sponsored by The Tuckerton Seaport Museum. We appreciate their support of Jersey Family Fun that allows us to share with families information about things to do with families in New Jersey and Ocean County day trips we think your family may enjoy. You know how awesome we think Tuckerton Seaport is. Whether it’s a great event or an interactive exhibit, there’s always so much to explore with the kids. 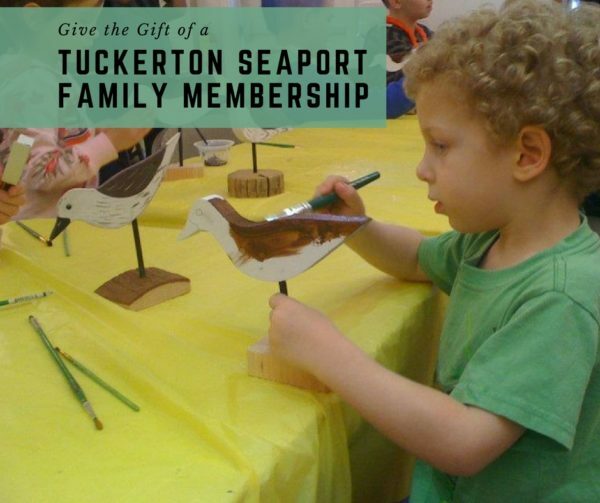 It’s why you can never go wrong buying or gifting a Tuckerton Seaport Museum Family Membership. Admission to all of these events and more are included in a Tuckerton Seaport Museum Family Membership. You can view the Tuckerton Seaport Calendar of Events on Jersey Family Fun’s Calendar of Events. Click over to see what the next Tuckerton Seaport event is. Pretend to be pirates by dressing up and playing on a ship (indoors or outdoors). Create a craft to take home in the Jersey Family Fun Kids’ Quarters. Climb to the top of the Tuckerton Seaport Lighthouse to get a great view. Play with the trains, kids never out grow them. Indoor and outdoor fun everywhere you look. Learning is made fun with interactive exhibits. Discover what new animals are in the Tuckerton Seaport touch tank. Feed or pet one outside in the farm area. Challenge each other in a round of miniature golf. One of the crafts we’ve had in our Kids’ Quarters at the Tuckerton Seaport. A Tuckerton Seaport Museum Family Membership provides your family with unlimited general admission for a full year. It also includes admission to ALL Tuckerton Seaport events. You’ll receive discounts on purchases at Tuckerton Seaport Gift Shop plus advance notification of Seaport happenings via a weekly email blast. Read more about the Tuckerton Seaport in our Tuckerton Seaport blog post series. Tuckerton Seaport Ticket Sales Price $9.00 per ticket for adults. $5 for children 5 and older. $6 for seniors. Kids under 5 and Seaport members are free. Veterans and Active Military as also free. Tuckerton Seaport Family Membership Sales Price $60.00 per family membership. Click over to www.tuckertonseaport.org to make your purchase. Tuckerton Seaport is located in Tuckerton at 120 West Main Street. You can check out our past articles about Tuckerton Seaport to see more reasons why it’s a great New Jersey Day Trip. You may earn an additional entry by leaving one comment on the Jersey Family Fun giveaway/contest blog post, that answers the question being asked during the timeframe of the contest. Comments that do not answer the question, while appreciated, will not be valid or count as meeting the requirement. Comments left after the giveaway/contest has closed will not be valid toward the contest. You must live in the tri-state area and be able to travel to this location to win. Tuckerton Seaport is located in Tuckerton at 120 West Main Street. The winner will receive 1 Tuckerton Seaport Family Membership. The membership is valid for one year from activation. The winners are responsible for his/her own travel costs during an event. Parking is free. This giveaway will end Wednesday, December 20, 2017 at midnight. The winner will be announced shortly after that. Make sure you have left us your email address. You will have 24 hours to claim your tickets by emailing us back your name to Melanie. All prizes not claimed will either remain with the company sponsor or Jersey Family Fun to be used at a later date. We will make every effort to get the tickets to you by Christmas, but we can not make any guarantees. Winners agree to provide contact and shipping information to Jersey Family Fun and/or the giveaway sponsor, including full name, address, phone number, and email address. Unless otherwise stated, giveaways and contests are only available to residents in the United States. Unless stated otherwise ticket and giftcard prizes are only valid in New Jersey and for specific dates/performances. Void where prohibited by law. My daughter loves the Halloween exhibit! Tuckerton Museum would be a great giveaway for 10 reasons. It’s educational, it’s fun, it’s local, my children love museums, they love ships, they love anything to do with marine biology. My son loves history, my daughter loves day tripsn they would love to dress up as pirates, and it’s a great winter activity! We love the Tuckerton Seaport from their Haunted seaport to their drop in painting classes. There is always something fun to do and see their. My daughter loves getting dress as a pirate. She gets dress when she goes to the PA Renaissance Faire. She also loves the touch and feed the animals. I think it might be a tie between the 2. My daughter also loves miniature golf. She can play that all day. My wife loves any kind of a museum. Grayson would dress like a pirate any day! Kids love to attend all the festivals and classes on how to make stuff. My 6 year old daughter loves to make her own craft and miniature golf. She would be between the two activities all day. The third thing is the interactive exhibits. 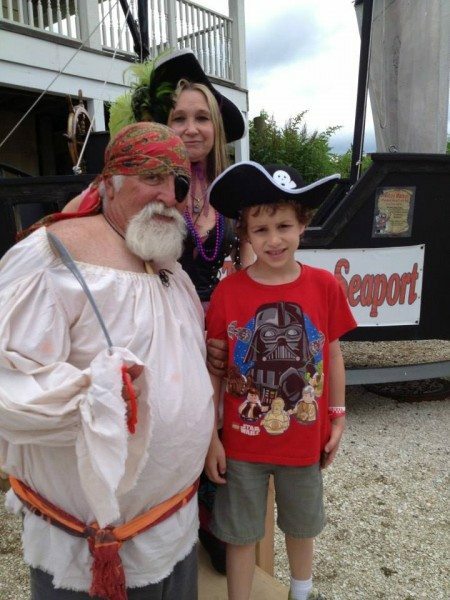 My kids love the Pirate Festival! I would love to win. I never visited. Thx. My girls are getting brace and would love the touch tank!